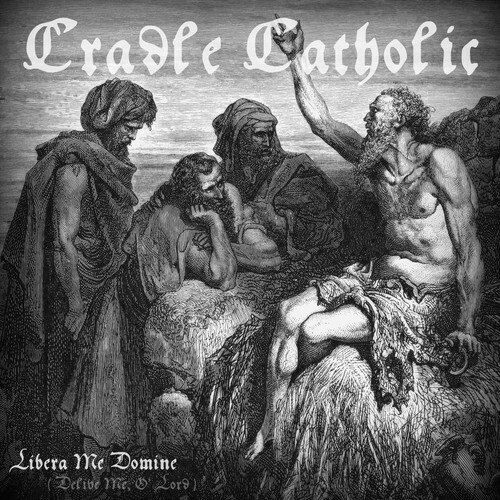 Cradle Catholic Combine Latin and Metal in "Libera Me Domine"
Cradle Catholic is a Catholic Metal band out of San Angelo in the USA. Their release “Libera Me Domine” (“Deliver Me, O Lord”) is an excellent showcase of Michael Brumley’s musical vision and should be enjoyed by fans of Catholic Metal everywhere. Due to the space that is available in our musical reviews, I focused on one song on the album and gave it an extensive listen and review. “Regina Coeli” (“Queen of Heaven”) is the song that I will focus on; it is indicative of the rest of this “must have” album. A copy of the song is embedded at the bottom of this review. Now that we have the lyrics with a comparable translation, this song seems to be very appropriate to this time of the year. All through the Church’s calendar year there are many devotional days to our Holy Lady; for example, today (Sept.8/2010) is the celebration of the Nativity of the Blessed Virgin Mary. As Catholics, the words to this prayer reveal a lot about our faith; and the music that Cradle Catholic offers to accompany the prayer is very well arranged to do the job. The space offered in the opening part of this song sets up the meditative state of prayer quite well; in fact, the first piece of music could exist on its own without sounding mediocre or hypnotically boring. The careful arrangement of strings along with the Latin sign of the cross extend the mood very well. The first part gets an extra “kick” with the addition of drums, bass and lead guitar that really bring out the theme. Next comes the tremolo picking party – a wall of sound erupts interrupted by spurts of slides screaming up the neck. The prayer is then started in the midst of this amazing musical mayhem. The energy behind the music capitulates the “Allelluia” which is stated in the first half of the prayer by the voice. With the final “Amen,” the song goes back to the original “mellower” part and has a beautiful finish with the strings. The strings do seem to be cut off a bit early in the mix; but this could be done for effect. The voice saying the prayer in Latin is very well done but I would have liked to have had it either pumped up a little louder in the mix or compressed a little tighter. There were some parts that seemed to fade a little bit. But then again, it did make me listen closer to the beautiful words of this devotional Marian prayer. My final word on this song is that if you are Catholic (or enjoy Catholic/Christian music) and you like heavy music – then you should have a copy of this song. Cradle Catholic (Michael Brumley) has presented an awesome piece of Catholic metal that is being giving away for free; I strongly encourage anyone who enjoys Catholic Metal to experience Michael’s ministry and get a copy of this song and enjoy it. There are more songs available on www.myspace.com/cradlecatholic. I love your song. Let’s team up! Sorry if I’m critical. There’s so much potential here, hope to see more!